Oreos are an all American treat that is enjoyed all year around but during the holidays it’s fun to dress up these classic cookies to add some festive flair. 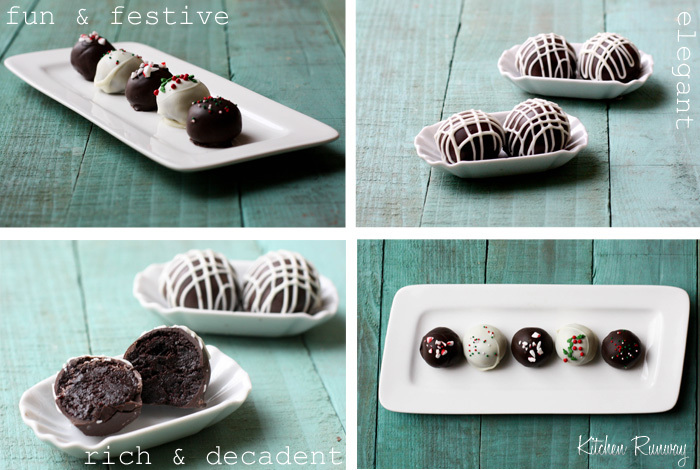 Oreo cookie balls or truffles are a simple concept but the results are pure decadence. Oreo cookies are finely crushed and mixed with cream cheese then rolled into bite size balls and dipped in chocolate. It’s a little bite of rich Oreo heaven. The white chocolate dipped cookie balls were made using Candy Cane Oreos. 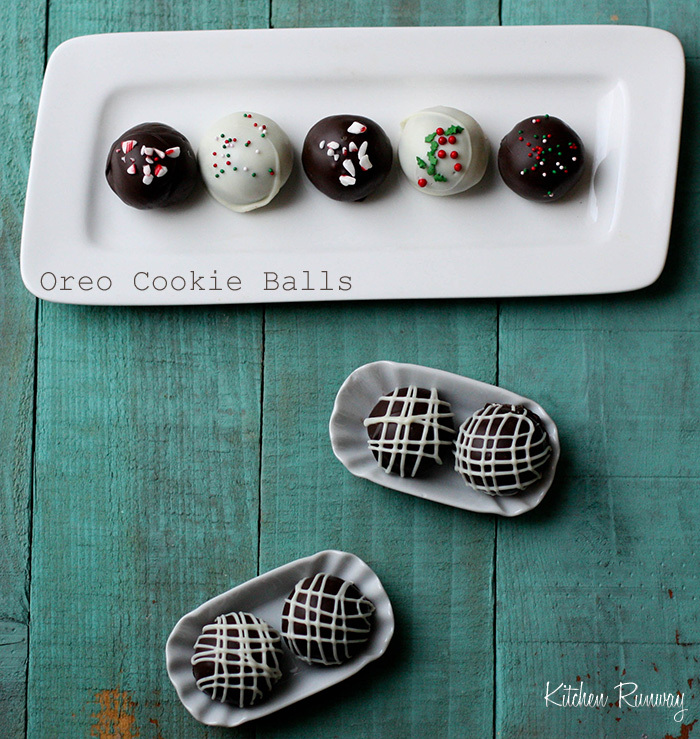 The chocolate dipped cookie balls were made using original Oreo cookies. Kitchen-Play and Oreo are teaming up to promote “Play up Dessert!” by adding Oreo Cookies. Yes, they’re good by itself but it’s even better when made into cookies and cream ice cream, or chopped up and added to brownies or blended into a milk shake. The great thing about Oreos is that these little chocolate cream filled sandwich cookies add a bit of fun and play to any dessert. The possibilities are endless and the results are always delicious. To encourage you to “play up dessert” Kitchen-Play and Oreos are giving away a gift package which includes Oreo Cookies, Crate & Barrel serving bowls, an exclusive Oreo cookbook and tools and supplies to help play up your Oreo inspired dessert. The package is valued at approximately $70.00. To enter, recreate any Oreo dessert from this Kitchen-Play event or come up with your own. Visit Kitchen-Play for more information. Good luck and I can’t wait to see your Oreo creation! It takes a little patience and practice to dip these cookie balls into melted chocolate. Mix the cream cheese and Oreo cookie crumbs until blended. I use my Kitchen Aid to mix the two. It combines in a matter of seconds. Using a 2 tsp scoop, shape the mixture into balls and place on a parchment or silicone baking mat lined baking sheet. Cover with plastic wrap and refrigerate for at least 30 minutes. Remove cookie balls from refrigerator and remove plastic wrap to help take off some of the chill. Melt the chocolate according to package directions. I used Ghirardelli melting chocolate (candy coating). 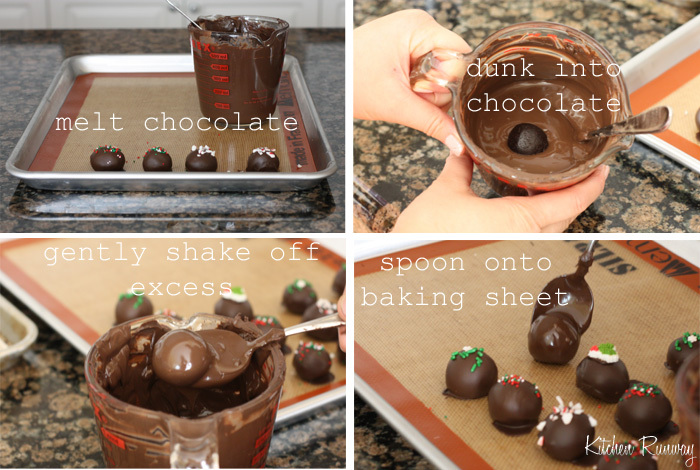 Reshape the cookie balls if needed and place into melted chocolate. Using a spoon, cover cookie ball with chocolate and gently lift cookie ball from chocolate and gently shake off the excess chocolate. Slowly slide the cookie ball off from the tip of the spoon onto a silicone lined baking sheet. Quickly decorate with sprinkles or crushed candy canes. Disclaimer: I was compensated for my time and efforts for this Kitchen PLAY post. All opinions are my own. This entry was posted in Christmas, Desserts, Easy, Entertaining and tagged brownies, cake, chocolate, cookies, cream cheese, dessert, Easy, party. I love everything about this! So pretty and they are tasty little treats! These are delicious!! Pictures are too adorable 🙂 I love the decoration on each oreo ball. So festive, fun, and cute!! These were amazing! My wife (Devil Wears Parsley) brought some home to me, I really liked them, thX!! Susan, Quynh & Angel: Thanks!